No kids’ winter wardrobe is complete without a sturdy pair of boots and Clarks has stacked their children’s collection with plenty of leather boot goodness. Clarks shoes are known for their long lasting wear and comfortable fit and the Delia Boots live up to the reputation. Perfect for cold days, they have a super cute girly feel with a fun floral print that any little rock chic will love. 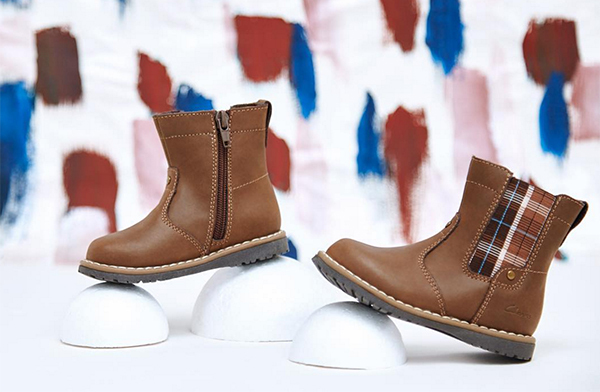 There’s a catchy winter boot collection for little boys too. The Drake Boot is a personal favourite, with an inside zip for easy fitting and plaid detailed elastic gusset. The leather boots are perfect for cold weather, casual outings or even for your little ones Sunday best. Available in a coffee or navy colour and priced at $90 they come in size EU 24-31. See the full range of winter shoes and boots online at Clarks.